I don't yet have one of these guys in my grubby little hands, but the announcement can now go public... At least I got the "official word" of the go-ahead, just haven't seen the fruits yet. 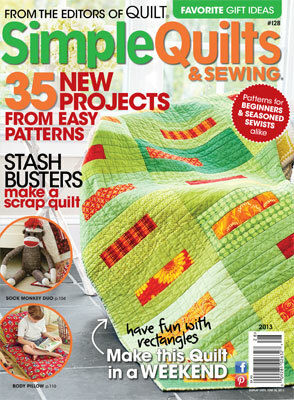 That spring issue of Quilt Magazine's Simple Quilts & Sewing that will be popping up in quilt shops, bookstores and magazine shops officially today, March 19th, will be featuring one of my quilts! ON THE COVER!! This is my first quilt ever to get publication and I am so thrilled! And they even catered the title colors to those of the quilt! The genesis of this little gem is actually quite a simple one. Last spring (2012) I decided to design something from scratch for the juried PMQG exhibition within the annual Sisters Outdoor Quilt Show, the largest such show in the country, I believe. I have to say that given the amount of talent and drive within our Portland chapter of the Modern Quilt Guild I was honored to have my Lock 'n' Bolt quilt among those chosen to exhibit. But what does a person do with this momentum? Run with it, of course. The question is, how? As those of you who have been following my blog are aware, I am approaching 2013 in a pro-active, positive, get-things-done sort of way, and this is perfect fodder for that fire. And in celebration of that energy, I'm offering a little GIVE-AWAY. A copy of the magazine (which always has a whole bunch of fun projects included! ), plus a little fabric bundle bonus. Leave a comment letting us all know either what project of your own has been the fire in your belly, or if someone else inspired you, please share your inspiration (and the credit) and perhaps where you hope to go with it. One thing I love about being involved in the quilting world right now is that we are truly a community - both online and in the real world. One that shares its experiences, its loves, its questions and difficulties, its techniques and its inspirations. So please share with me as I am so eager to share with you! A winner of the give-away will be announced one week from the magazine release date (March 19), on Tues. March 26th. Oh, and if you want to enter the giveaway, please be sure to leave an email address in your comment. International entries welcome.